A few months ago, Blizzard Watch put out the call for more writers. As with any company, people come and go. In an organization where full-time isn't a thing, people got busy and couldn't contribute as much as they have in the past. They felt they could take on a few more people to cover Battle for Azeroth and all the other Blizzard games. If you paid any attention to events in the Blizzard world last week, the first Overwatch Championship was broadcast LIVE on ESPN. This is huge, even if many Twitter people were, "What the heck is this?" After thinking about it for, roughly, two weeks, I decided to apply. I nervously filled out the form, wrote a quick 300 words on our upcoming drive for hippo mounts, and then stewed for 2 hours before finally hitting "Send". Then, I promptly forgot about it. That was probably a good thing because, on Friday, July 27th, I was invited to join the Blizzard Watch staff as a part-time writer. To say I was overwhelmed, was an understatement. I actually opened, closed, opened, and closed my email account and clicked on the email from Adam Holisky three times before it finally dawned on me it wasn't a joke. It is a paying position. I have writing assignments. You thought you were guinea pigs before; brace yourselves. I am very excited to be a part of the staff. Please send Elizabeth Harper (Faience) positive vibes because she gets to edit me. There's quite a bit to learn about posting, but you can expect to see some of the over 7300 screenshots in my screenshot folder used as headers in what I write. I will probably wind up, once I get going, cutting back on my WOW time because I'll need to write, but that won't affect the running of the guild. I'm still here; still active; still looking for creative ways to die. If you follow the guild Twitter, @SpecDeath, you'll see that is not the Twitter under my name. I've had this Twitter name for years, but hadn't used it. You're welcome to follow this account, too. It will be, mainly, for Blizzard Watch and Blizzard-related items. 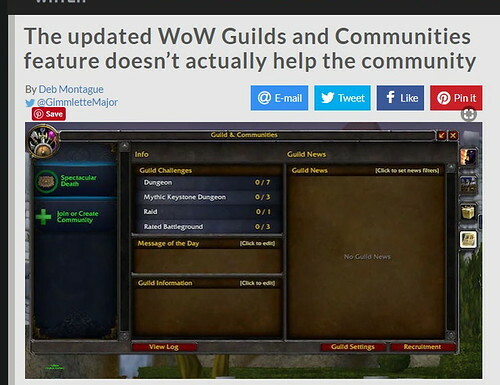 @SpecDeath is where I post cat photos and announcements and screenshots of what the guild is doing. Thanks to everyone in game last night, for your warm congratulations. Expect the shenanigans of Spectacular Death to show up in more than one post. Tyreon That is so cool, congrats! We had our monthly transmog contest last Friday. We went to old Nagrand, to the site of the carp soccer game from a Miz Special of several months ago. The theme this month was "Dress as a fish or in the colors of one of the World Cup Soccer teams". We had a great turn-out. Left to right: Tarsan, Brighide, Aeliel, Gizmo, Gimmlette, DorvakLynx, and Connacher. Jaxdia, in the form of Lianth, was the judge, owing to her win last month. She chose Gimmlette at the winner of this month's contest. She said it was on the strength of the gun. Couldn't you just see a row of hunters, equipped with this gun, lined up in front of the horde? Behind them, a row of hunters with tridents. That would be glorious and an amazing screenshot. Second place went to Connacher and Aeliel (Perki). Third place was DorvakLynx, who dressed in the colors of Spain. You can see all the contestants, here. Next month is going to be horde only. It is Deathtacular's 10th anniversary. The contest date is Friday, August 10th. This contest is EARLIER than others because I've heard something is happening on the 13th-14th. We will meet in Orgrimmar. The theme is "Make a tmog to scare Alliance". So, because I'm the judge, scare me. As promised, here is the first installment of the Warbringers series. For me, this raises more questions than it answers. Oh look! We have a Lore chat room in Discord. You can go there and discuss everything. Beware, this chat room does NOT have a restriction on spoilers. If you don't want to know things, it's probably not, when people are in alphas, betas, and PTRs, a good place to go. 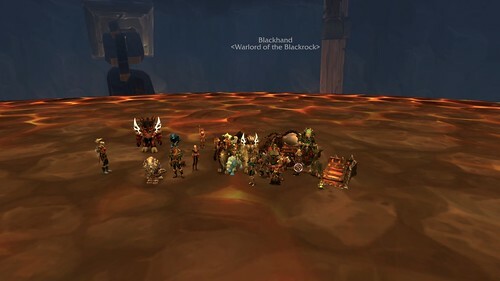 Deathtacular will run into Blackrock Foundry on Saturday in another attempt to get the mythic raid achievement. The last time we were in here, it took us an hour to clear the place. But, we didn't get the achievement. It turns out, we MUST have at least 16 guild members to get credit for the achieve. Please, if you have a level 100+, we need you on Saturday. We're going to start in the Foundry. If that goes as well as it did the last time, we're going on to Highmaul and get that achievement. If it takes us longer than we expect to clear the raid in mythic, then we'll go kill Ruhkmar and, maybe Kazzak, and either Drov or Tarina. We don't have achievements for those world bosses horde side. This will be the last organized horde side raid until probably September. Please come help us get the achievement. Meet outside the Foundry at 8:45. Souvlaki Thanks for the run! I hope we can get the 16 people together next time. I'm late in acknowledging transmog winners. Everyone, except Sofie, have their winnings. 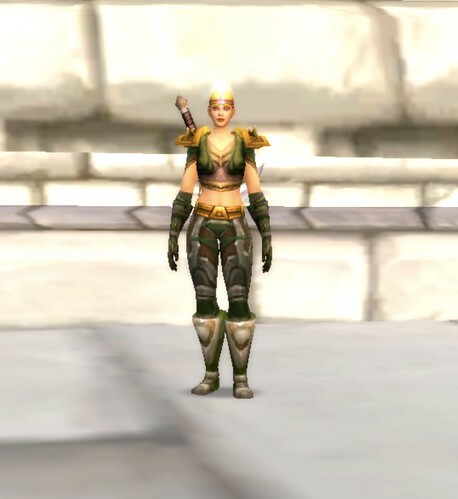 The theme was "Tmog with a battle pet". Souvlaki was the judge. Here, he looks over the contestants. That horde on the end is Sofie. We had to keep watch to make sure the guards didn't attack her while the contest was going on. The winner for June was Jaxdia. Her pet was the monkey with the mining helmet, but it kept taking off so I didn't get a photo of it. You can see the other contestants here. 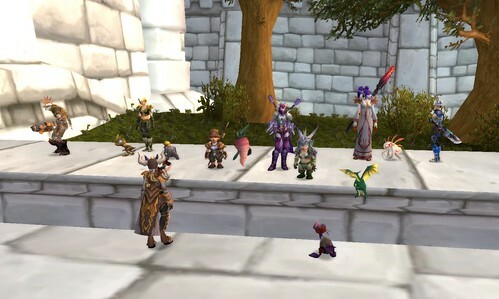 July's transmog contest will be held Friday, July 27th. The theme will be based on the World Cup and our carp soccer game. We'll travel to the floating islands in old Nagrand. Your transmog should be either something fishy or based on the colors in one of the World Cup teams jerseys. Raynea (Jax) will be our judge. 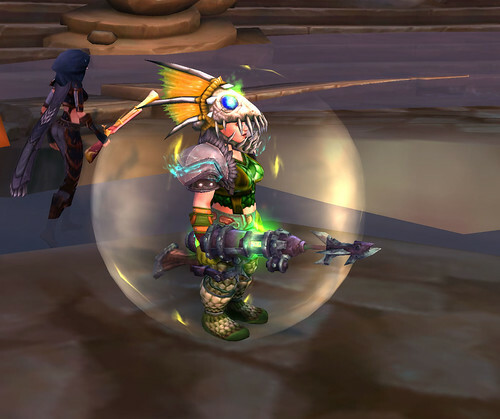 Now, we are announcing August's tmog contest now. With Battle for Azeroth dropping on the 14th, we decided you'd probably want to play your toon instead of doing a transmog. So we're moving the contest to Friday, August 10th. That actually happens to be the 10th anniversary of Deathtacular. 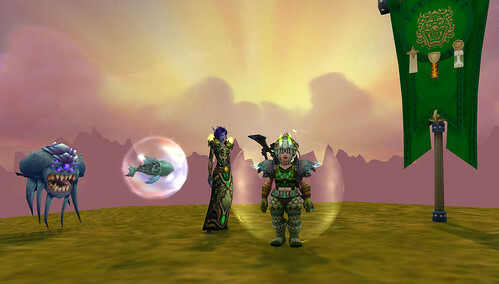 The transmog will be held in Thunder Bluff and will involve ONLY our horde toons. 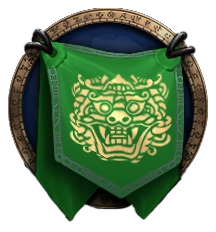 No Alliance will be allowed to enter the contest. There are a few places we can have our contest where Alliance toons can watch without too much problem. The theme for the horde-only tmog will be "Make an outfit designed to scare the Alliance", in keeping with BfA dropping 4 days later. Let your imagination run wild here. Congrats to our winners. See you on the 17th.